Sometime ago I blogged about an interesting micro oscilloscope, (post) well it's now available to buy in the UK from www.coolcomponents.co.uk for £31. I like the idea of this scope but it's a bit small but I beleive that it will get a PC based front end to view the scope data on the PC, this may be a cheap alternative to the picoscope! 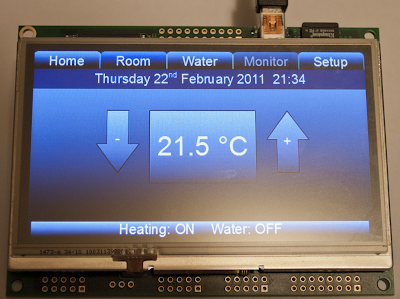 I've recently discovered these iSmart TFT modules, which combine an ARM9 processor core with a 480x272 colour resistive touch display, 24 I/O lines, RS232, USB, I2C interfaces and an RTCC plus more! The module uses its own programming language to control a collection of pre-defined screens, up to 100,and also control the I/O and external interfaces. These programmes are written in a text editor and stored on a uSD card, when the module powers it runs a file called TU480a.mnu, this contains the code. The language is very different to C and is an object orientated type more like html, each "entity" is given a style, this is then used whenever the entity is used on the screen. 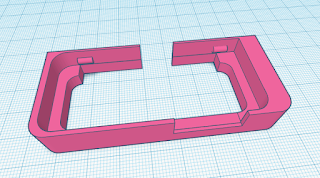 The programme can be loaded into NAND so it can be run without the uSD card inserted and you are able to send data to and from the screen via the serial port so I assume it will work in conjunction with the Arduino platform, at least that's what I'm hoping! So far I've just loaded a couple of screens, which I generated in Open Office Draw and then grabbed the screen and re-sized to fit, and then added a couple of touch areas to switch between them. For the Arduino community there is the problem with there being no libraries so everything would need to be done in code and also another thing to note is that it's not open source code or hardware.